The old parish church of Romsey was formerly the Abbey Church of St Mary & St Aethelfla. The site had Saxon origins, although the structure itself came almost entirely from the Norman era. 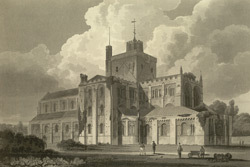 The abbey was dissolved as a religious house in April 1539 and the building was bought by parishioners for use as their parish church in 1544.